Background: B23/nucleophosmin (B23/NPM1) is an abundant multifunctional protein mainly located in the nucleolus but constantly shuttling between the nucleus and cytosol. As a consequence of its constitutive expression, intracellular dynamics and binding capacities, B23/NPM1 interacts with multiple cellular factors in different cellular compartments, but also with viral proteins from both DNA and RNA viruses. B23/NPM1 influences overall viral replication of viruses like HIV, HBV, HCV, HDV and HPV by playing functional roles in different stages of viral replication including nuclear import, viral genome transcription and assembly, as well as final particle formation. Of note, some virus modify the subcellular localization, stability and/or increases B23/NPM1 expression levels on target cells, probably to foster B23/NPM1 functions in their own replicative cycle. Results: This review summarizes current knowledge concerning the interaction of B23/NPM1 with several viral proteins during relevant human infections. The opportunities and challenges of targeting this well-conserved host protein as a potentially new broad antiviral treatment are discussed in detail. Importantly, although initially conceived to treat cancer, a handful of B23/NPM1 inhibitors are currently available to test on viral infection models. Conclusion: As B23/NPM1 partakes in key steps of viral replication and some viral infections remain as unsolved medical needs, an appealing idea may be the expedite evaluation of B23/NPM1 inhibitors in viral infections. Furthermore, worth to be addressed is if the up-regulation of B23/NPM1 protein levels that follows persistent viral infections may be instrumental to the malignant transformation induced by virus like HBV and HCV. Keywords: B23/NPM1, nucleophosmin, viral infections, antiviral therapy, inhibitors, antiviral drug, virus. Keywords:B23/NPM1, nucleophosmin, viral infections, antiviral therapy, inhibitors, antiviral drug, virus. Abstract:Background: B23/nucleophosmin (B23/NPM1) is an abundant multifunctional protein mainly located in the nucleolus but constantly shuttling between the nucleus and cytosol. As a consequence of its constitutive expression, intracellular dynamics and binding capacities, B23/NPM1 interacts with multiple cellular factors in different cellular compartments, but also with viral proteins from both DNA and RNA viruses. 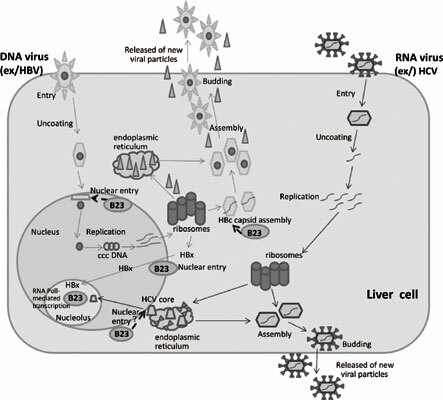 B23/NPM1 influences overall viral replication of viruses like HIV, HBV, HCV, HDV and HPV by playing functional roles in different stages of viral replication including nuclear import, viral genome transcription and assembly, as well as final particle formation. Of note, some virus modify the subcellular localization, stability and/or increases B23/NPM1 expression levels on target cells, probably to foster B23/NPM1 functions in their own replicative cycle.